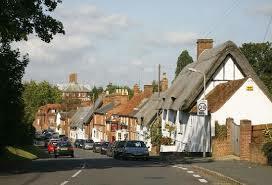 Winslow is a charming market town, perhaps best known for its striking town hall. It is a lively place with plenty of annual traditions and activities where fresh food and produce is very much appreciated. This was where we were recently hired to cater for a large family reunion comprising of around 300 people. The event was to be held mainly outdoors; oddly, at the site of an old barn which one of the family members owned. Thankfully the fact our machines use gas bottles meant there was no worry about dragging extension cables through the barn and outside. Tables and chairs were already set up outside in the sun when we set to work making the menu from scratch and cooking the huge hog. 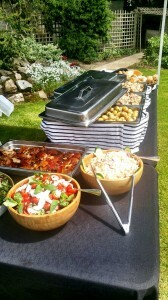 We often find that our hog roast Winslow catering really shines at outdoor events, and a recent event was no exception! Having being allocated a spot under the shade of leafy trees, we quite simply pulled the roasting machine over the cobblestones and over the grass with just a little elbow grease. Thankfully, each machine is fitted with wheels under its sturdy undercarriage, and a pair of easy grip handles on either side. As a hog roasting chef who has had to set up the machine in the middle of fields before, I can honestly say that these functions are quite the godsend. On a summer’s day, the smell of delicious cooking pork wafting in the air really does exemplify what is best about British cooking. A beer and delicious pork in a roll in the sunshine is sheer perfection! Our waiting staff served all the guests at their tables with a selection of starters (mini pizzas, soups and salads) and quickly prepared for the main. I quickly and efficiently carved off plenty of meat for each plate, and soon enough the entire party was tucking into delicious pork and crackling, with gravy or sauce and potatoes. After the great spectacle of the whole roasting hog and the delicious crackling and pork with sauces and salad, I heard most of the guests mutter that they were full and wanted to sit for a while. After clearing the final table, we waited ten minutes before waiting staff and brought out our desserts on trolleys to take around the tables. I was not surprised when those who said they were full just moments ago suddenly found room in their bellies. With gorgeous-looking puddings like profiteroles, cheesecake and fresh fruit salad (of course with a helping of cream), it was no surprise at all. In the end, there was only half one of our large trifles left, which was later devoured by our hosts’ teenage daughter and her boyfriend. All leftovers from the hog roast itself was carved by myself and set out with a selection of our sauces alongside some snacks and canapés, and I did see guests picking at it as we began pack up our machine and carried all our rubbish to the van. We also hire out our machines themselves to those of you wanting to have a go at carving your own hog at a hog roast Winslow event or party. We supply the machine with a full bottle of gas and are more than happy to source you a hog if you can’t get hold of one yourself. Our machines are straightforward and simple to use, but we will issue you with full instructions if you’re a newbie, and perhaps some tips if you’re a pro. Don’t want to roast a whole pig? With the attachments (which we will of course supply) you can roast ham, turkey, chicken, beef, lamb…you can even cook burgers and vegetables. You’d be surprised how easy it is. The powerful motor is capable of turning some real beasts of the pig world on its spit! Imagine the pride of roasting your own hog or series of chickens for your guests; or perhaps you have considered hog roast hire Winslow to sell your food at car boot sales or fares? 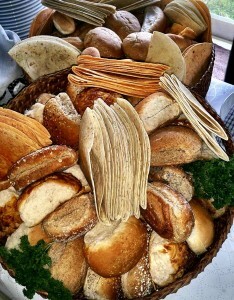 Many private caterers end up buying a hog roasting machine after hiring one from us. There is no doubt that the delicious taste of perfectly cooked meat is welcome at all sorts of events, and wherever you go you can be assured of the quality of our machines. In case you’re not certain though, we are more than happy to hire out a machine to you before you make your decision. You can hire out one of our machines for a day, a week, or even a month and see for yourself have easy they are to use and how popular you will be at any event. Contact us now for details and let us help you with the catering at your hog roast hire Winslow event, not matter what the size!